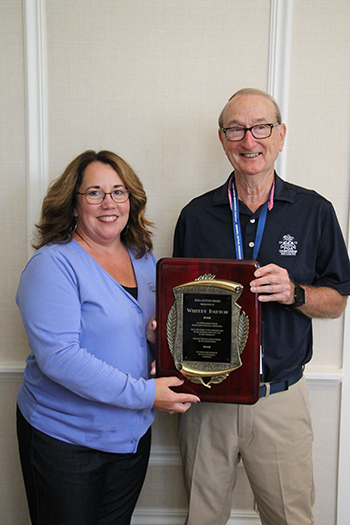 Peoria, IL - Whitey Patton was honored with the prestigious LAUTUM Award at the 137th Annual Convention of the Illinois Association of Mutual Insurance Companies (IAMIC) in August. Mr. Patton is the owner of Patton & Company, PC and provides accounting services to many of the Farm Mutuals in Illinois. Mr. Patton was the first Associate Member to ever receive this award. The nomination for Patton stated, “While working with Whitey, I have witnessed his constant support of the Mutual Industry and, specifically, the Association. He shares his knowledge with IAMIC members to improve their daily operations.” From the Executive Director, Jackie Rakers. “Whitey is well respected by his customers”, Tony Koehler, Manager of Camp Point Mutual said he runs ideas past Whitey before approaching his board of directors when looking at the financial growth options. Mr. Patton is very active in his community, serving on the National Bank Board for over 35 years as well as numerous boards of charitable organizations and the local school board. He is a member of the First Presbyterian Church and a U.S. Army veteran. Whitey is married to Linda and has two children, Brain and Amy (both CPAs), and two grandsons, Elijah and Caleb. His daughter Amy tried to remove herself as being his daughter when asked for her comments, but that was easier said than done. Amy said, “when it comes down to it, my dad’s passion is working with the people of the farm mutual industry. I went to work with him 22 years ago. He told me that you won’t meet any better people than the folks that represent the Mutuals. He was right, but he forgot to include himself in that statement.” Our industry agrees we are proud to recognize him with this honor. LAUTUM is Mutual spelled backward and stands for strength, dedication, leadership, commitment, integrity, and honor. 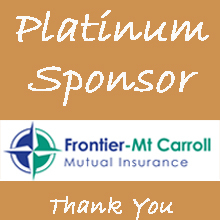 The award originated in 1972 as a measure of recognition for outstanding individual contributions to the community, the association, and the mutual insurance industry. The LAUTUM Award is presented to the person who has earned the respect and esteem of his colleagues. Recipients are nominated by their peers. The Illinois Association of Mutual Insurance Companies is a trade association comprised of farm mutual insurance companies. Mutual insurance, like the farming industry, has been a part of the Illinois landscape for well over a century. IAMIC provides member companies with educational opportunities, professional development, legislative support, and industry recognition.